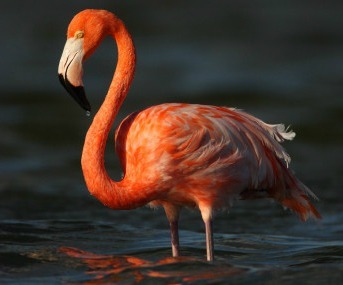 The Caribbean Flamingo has a length of about 120 to 145 cm (~47.2 to 57″) with a wingspan of 140 to 165 cm (~55.1 to 65″), weighing some 2.1 to 4.1 kg (~4.6 to 9 lbs). (Males are slightly larger than females). They have long slender legs, a long thin neck, long pointed wings and a large curved bill. The toes are webbed. They are know especially for their pink and reddish body with lighter feathers on the back. The legs and feet are pink, and the wings are edged with black flight feathers that are only visible in flight. The bill is pink with a black tip and is pale yellow at the base. Juveniles have a gray and brown plumage with traces of pink.